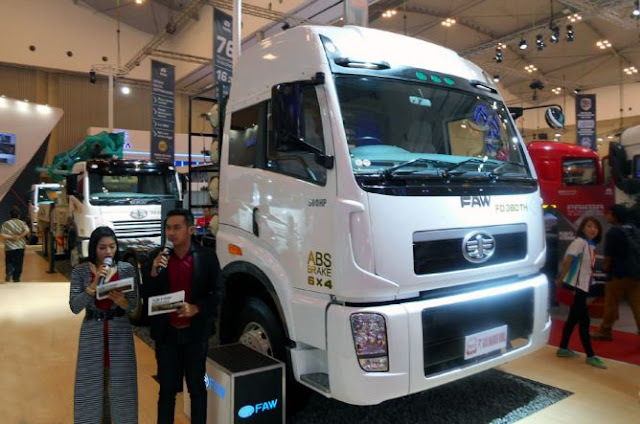 PT Gaya Makmur Mobil displays the type of Heavy Truck and Medium Truck at the launch of the product in GAIKINDO International Auto Show (GIIAS) in 2015. FAW are adopting the features and advantages of this European vehicle, claimed to provide driving comfort class. "Truck is also equipped with a safety feature air brake," said Robert Lie, President Director of PT Gaya Makmur Mobil. "For the ability of the wheels, the rear differential lock has been used, so that the truck remains safe while mired in the mud," he added. "To give European vehicle comfort, this truck is also equipped with ac and audio systems as well," added Robert.